Mark your calendars… There is a very cool 3 day conference in Desert Hot Springs that your’s truly will be doing a presentation for… Hope all of you come….It will be a powerful event…. It is time to create a shift on Earth with the evolution of our consciousness. 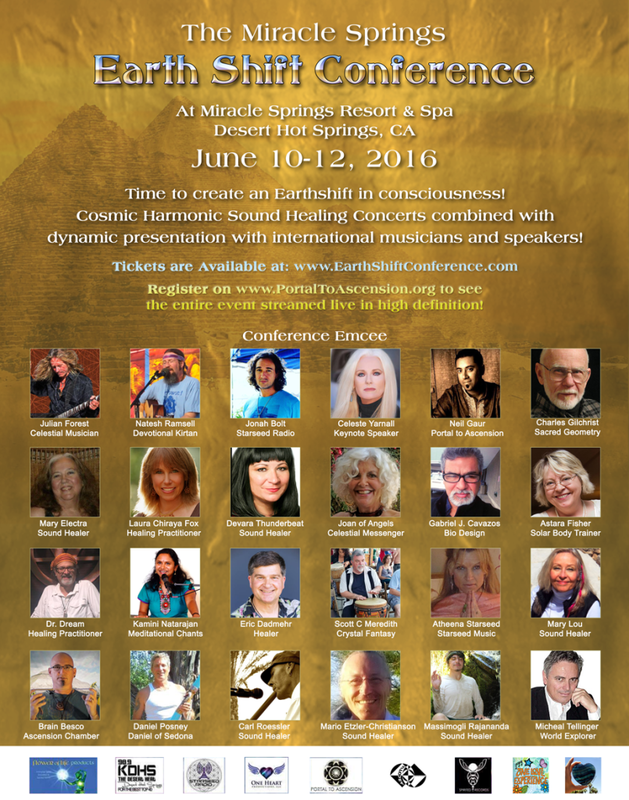 Join us summer June 2016 for a revolutionary live gathering in the beautiful Miracle Hot Springs Resort in Desert Hot Springs, California and experience cosmic harmonic sound healing concerts combined with dynamic presentations on a range of consciousness related topics. Featuring international musicians and speakers. This is a global event calling out to the world so we may come together and assist in the awakening process. The entire weekend will also be broadcasted and livestreamed online. Details will be released soon about the livestream. Kamini is a Indian Classical and Kirtan singer based in Los Angeles area. She likes to incorporate various ethnic sounds from different parts of the world into her music. She truly believe that music unites the entire world and brings us closer. Kamini spent over a decade learning Indian classical music and won several national level awards for her music in India. Her music is spiritual, soulful, mystical and simply engaging. She incorporates intricate Raagas and traditional rhythm patterns – “Taals” into Kirtan music. This blend of Raagas and Taals along with Sanskrit Mantras lifts listeners into a higher state of consciousness- a state of pure bliss, away from day-to-day stress. Presentation: Kamini will be leading a Kirtan and Naad-Yoga session. Naad-yoga is the Yoga of sound. Naad-Yoga is based on the experience of sound vibration and its effect on the body and mind. Kirtan singing helps with this as we chant mantras and use sound, breath and rhythm to enable us to go deeper into a meditative state.